Do You Desire Clean Drinking Water? Have you ever asked yourself the question, “How clean is my water I am drinking?” Even though our water enters our homes from the municipal system and goes through a thorough treatment plant, it can still pick up contamination in the pipes before it reaches your home. Here at Micro Plumbing Inc., we recommend having your water tested to see if there are any harmful pollutants in your water. 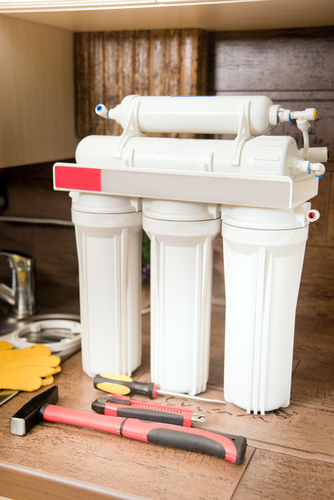 Then if necessary, we can arrange for the installation of a Reverse Osmosis System that will meet your needs. A reverse osmosis system is a system we install for better and healthier drinking water. These devices are among the most effective filtration systems available today. They work by creating two areas of water pressure inside them, and using the pressure difference to force the water containing contaminants through a semi-permeable membrane that will filter out very tiny pollutants. Here are some of the benefits from having a RO System installed in your home. Reverse osmosis filters are effective at blocking chemical pollutants, such as radon, chromium, and fluoride, all of which will usually get through standard charcoal filters. These filters will also remove arsenic and chlorine, providing you with the cleanest water possible. Another reason to install a reverse osmosis filter is to counteract excess sodium ions that water softeners can create. If you have added a water softener to protect your plumbing, but have found that you don’t like the “taste” of the water, a reverse osmosis filter will help to counteract the problem. You are here: Home > Uncategorized > Do You Desire Clean Sparkling Drinking Water?